Shopping for Ranma 1/2 Action Figures? The popular manga series Ranma 1/2 continues its run with SH Figuarts by bringing Ranma's rival, Ryoga Hibiki to the line-up. 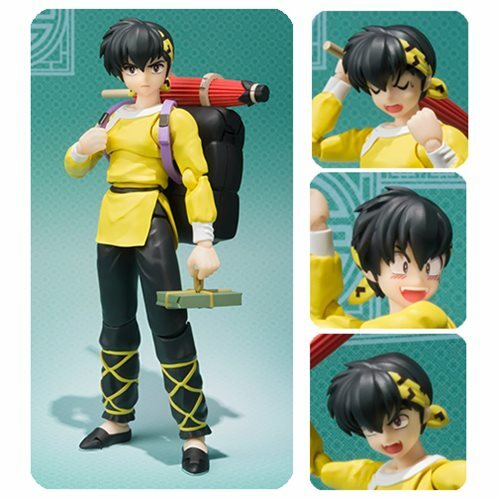 The Ranma 1/2 Ryoga Hibiki SH Figuarts Action Figure includes 7 optional right hands and 6 optional left hands, 3 optional expression parts, Ryoga's umbrella, a box of goodies, an optional backpack, one part for holding an umbrella, one base part for fixing the backpack and a set of base of its own. Figure measures just over 5 1/2-inches tall! Ages 15 and up.